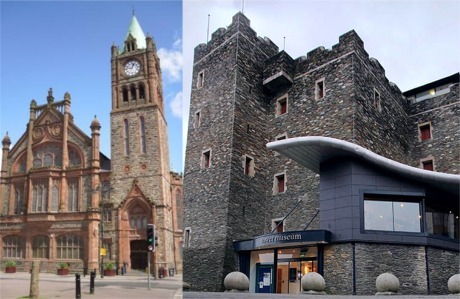 TWO of Derry's top attractions, the Guildhall and Tower Museum, are continuing to draw a growing number of visitors each year, according to annual figures. During 2015 the Guildhall welcomed 312,704 visitors through its doors amounting to a 5% increase on the previous year. The building, which underwent a £10m regeneration completed in 2013, is used as a venue for major events such as St Patrick’s Day, Culture Tech, Halloween and the Craft Fair, as well as hosting weddings and concerts. In 2015 the Tower Museum welcomed 22,749 visitors which again resulted in a 5% increase on the previous year. The Guildhall and Tower Museum in Derry. The figures were revealed in a paper presented to the Council’s Business and Culture Committee. Museums services manager Michelle Murray said she was delighted to see the rise in numbers. “It’s fantastic to see that we continue to build on our visitor numbers. Since the renovation of the Guildhall we have seen a major increase in visitors which is rising each year. The increase is testimony to the work of our dedicated team who go out of their way to provide a warm welcome to everyone who comes through our doors, as well as the increasing offer we provide in terms of hosting events and exhibitions," said Ms Murray. During peak months, figures show that the main influx of visitors to the attractions are from America, with a strong representation of European visitors. However the domestic and UK market formed the highest percentage of visitors during off peak season.